The McCoy family has been in business since 1927, and they’ve been a building-supply retailer since the 1940s. Their company caters to the DIY crowd, contractors, independent builders and farm-and-ranch customers in five states, and all locations still close on Sundays. Maintaining a store count in the mid-80s for the last decade, McCoy’s will open two new stores in 2017 in Alvin and Montgomery, TX. Footprints will include 18,000 square feet of retail space and a 20,000 to 25,000-square-foot lumber yard. 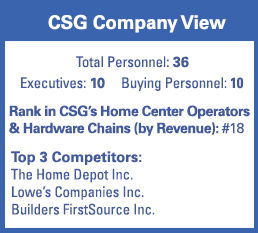 Source: Chain Store Guide Database of Home Center Operators & Hardware Chains and company statements.